There are brilliant arc lights in Union Street this evening.Does anyone know what's being filmed outside the new Travelodge hotel?I'm just so nosey,but don't want to have to go out there in the dark to find out! It's an advert for Transport for London. 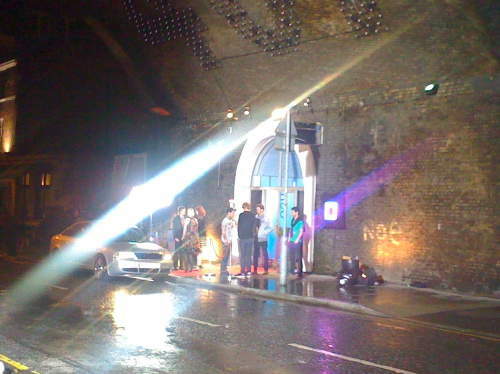 The old Cafe 231 has been done up as a nightclub called 'Neo'. Aha!Thankyou for the great photo and for the info,James.The trouble is that it looks all too inviting for an entrepreneur to ignore..what we'll have to do Zoe,is to put all of our euros in a pile ,buy it out between us and turn it into a mushroom farm. Now that's an excellent idea, I've just bought a book on wild mushrooms as well, so we won't even poison ourselves. There was a place under the arches near st.thomas street london bridge that grew mushrooms! dont know if it's still there now! you could get the spent compost from there eons ago....the only mushrooms grown there now one would imagine are magic ones! My goodness James,you have got your ear to the ground !Thank you for remembering about my query,it'll be fascinating to see what they filmed. I am glad that you posted this James,I still haven't seen it on tv.Thankyou !